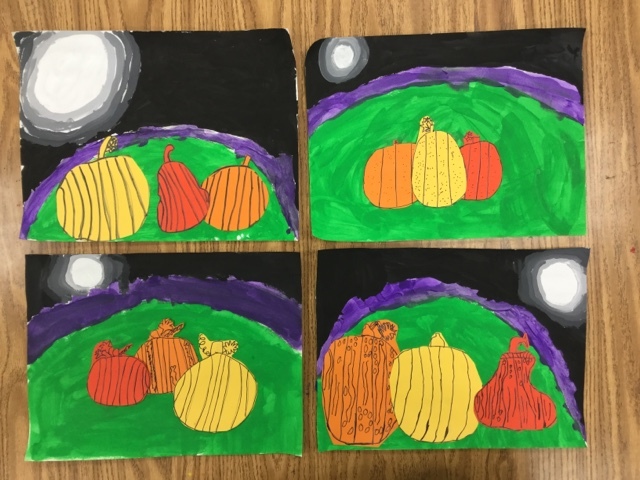 This project is not only seasonal and fun, but it packs in lots of learning. 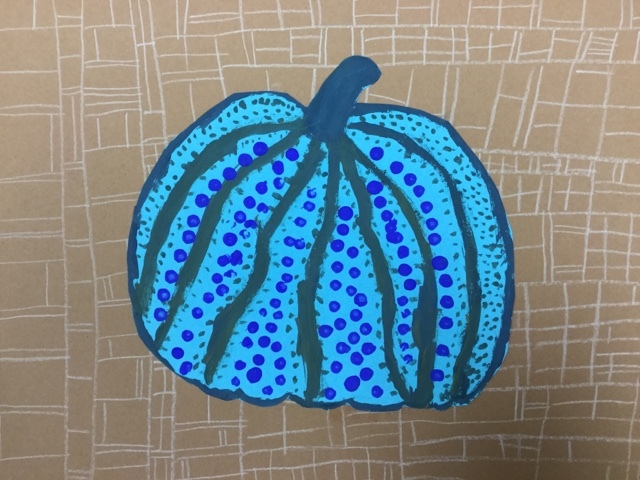 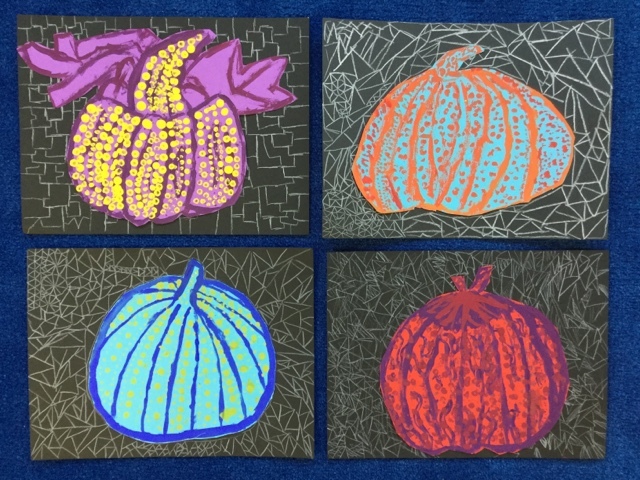 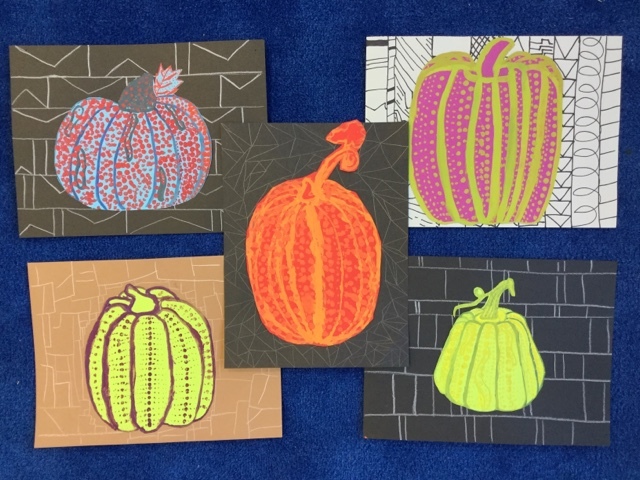 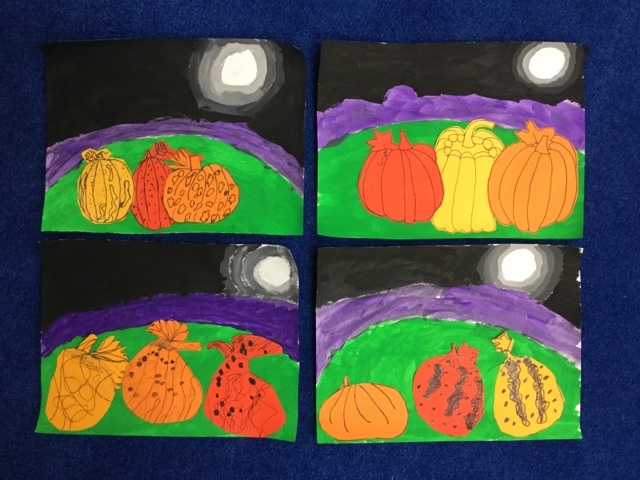 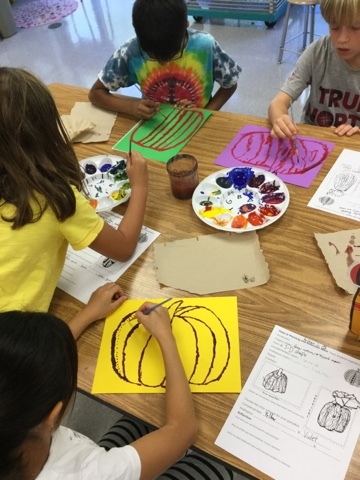 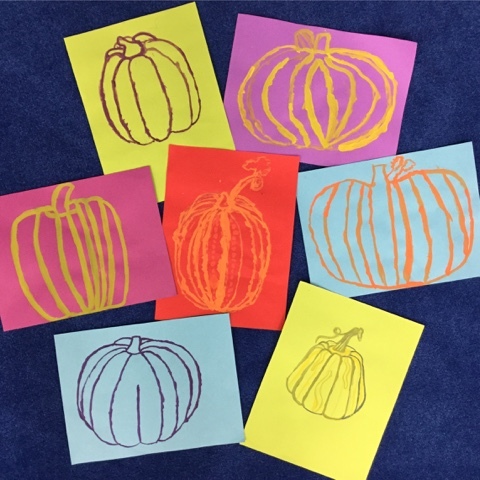 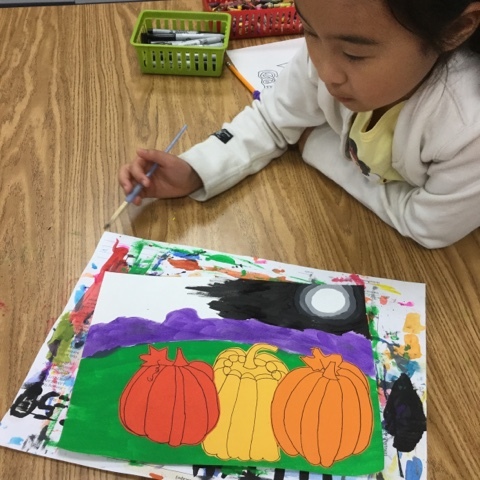 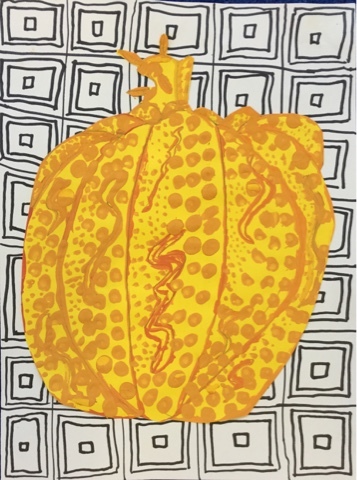 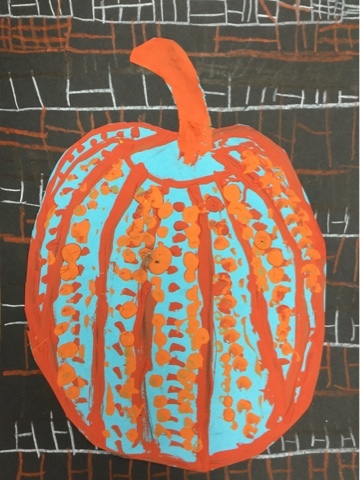 To begin, we observed small pumpkins and drew thumbnail sketches on our Pumpkin Painting Planning & Reflection Sheets (now available as a FREE download in my Teachers pay Teachers shop). 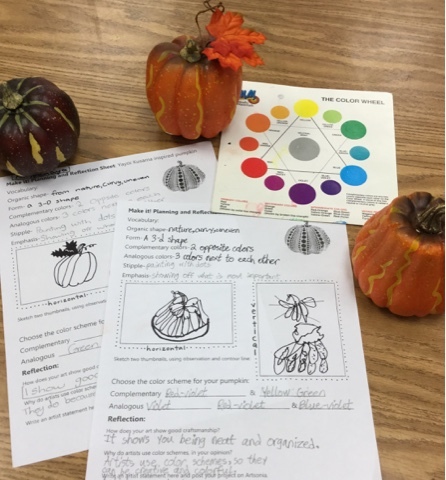 We also studied the color wheel and selected a complementary(opposite) or an analogous(next to) color scheme and wrote it down on our planning sheet. 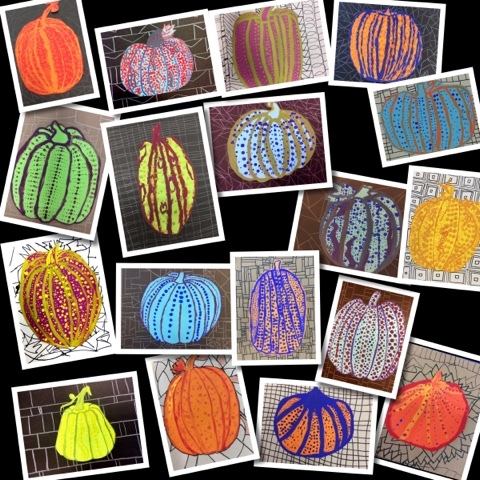 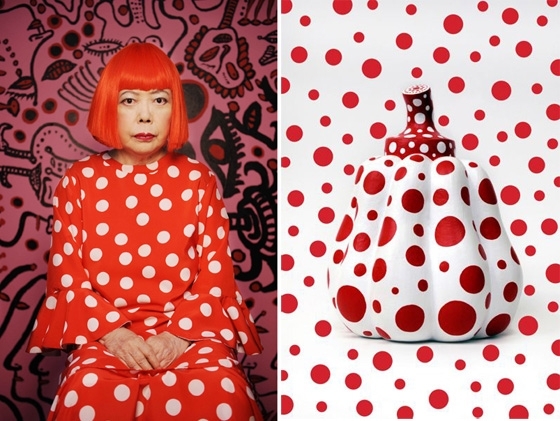 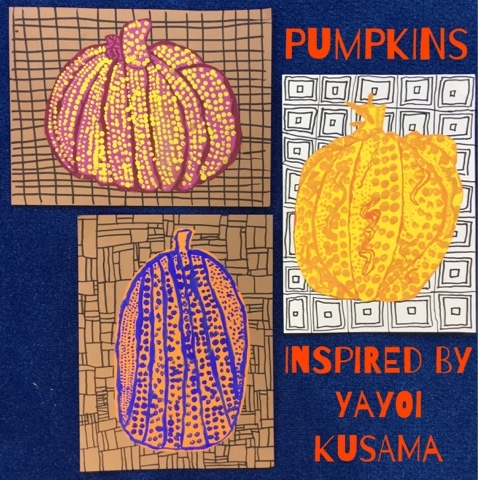 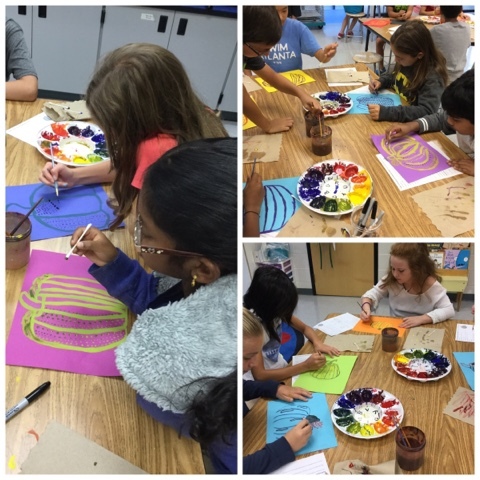 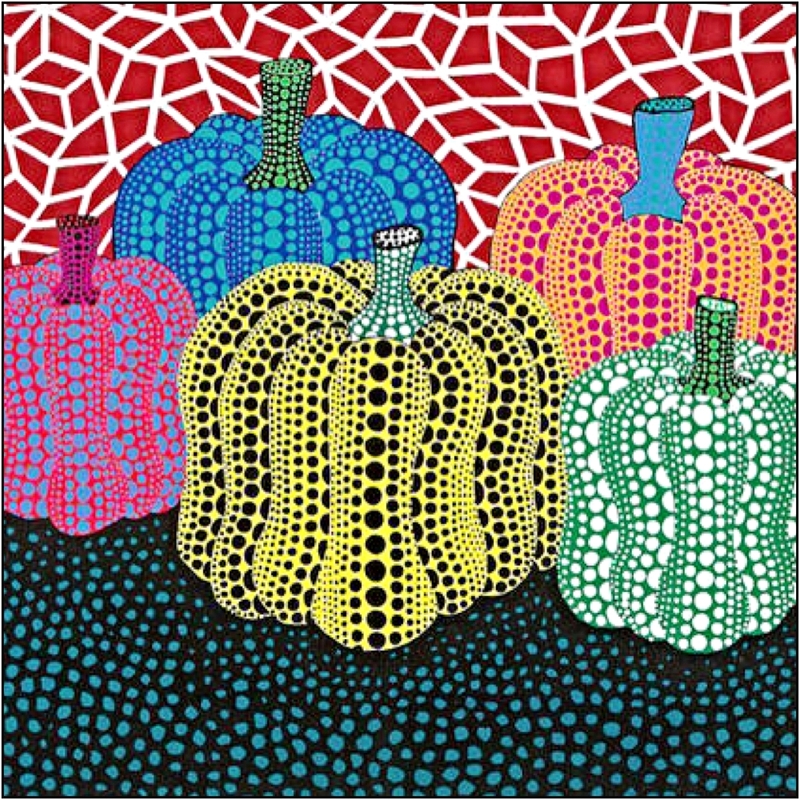 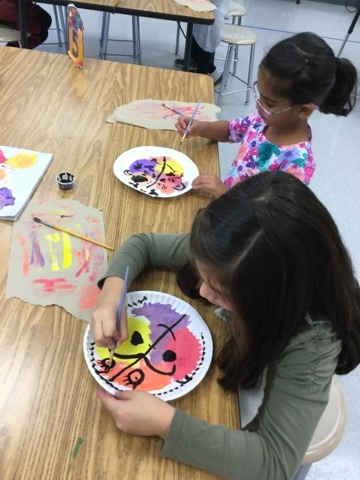 Mixing colors in our color wheel trays was a fun challenge, and students examined some of Yayoi Kusama's amazing pumpkin art - paintings, sculptures, installations - to see how she creates optical illusions with her rows of large and small dots. 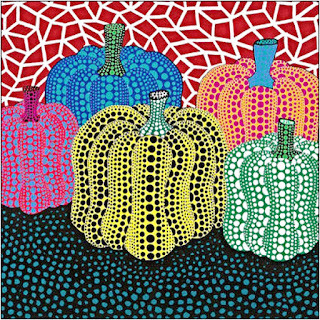 Once the dots are complete, we create contrast in the background with neutral colors and geometric shapes, adding emphasis to our bold, bright, organic pumpkin forms. 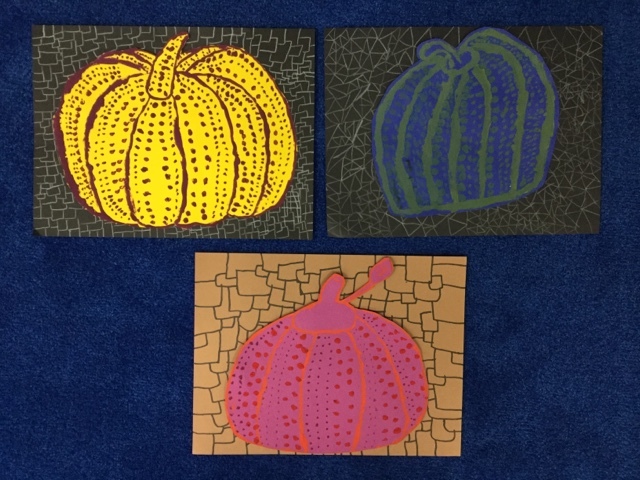 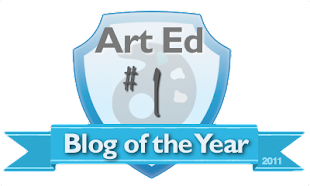 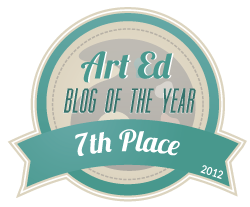 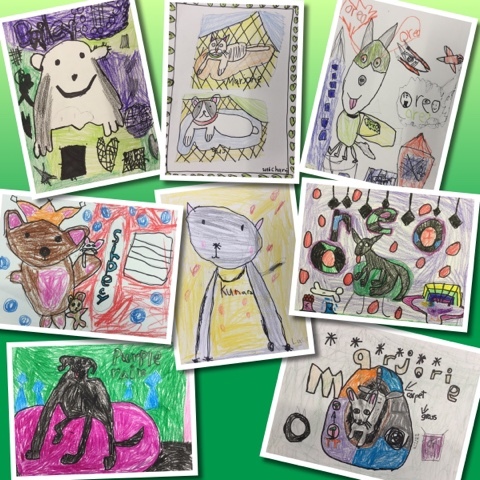 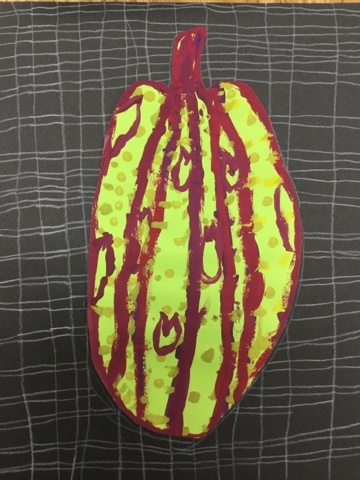 Students answered reflection questions about craftsmanship and artist choices, and finally uploaded them to Artsonia. 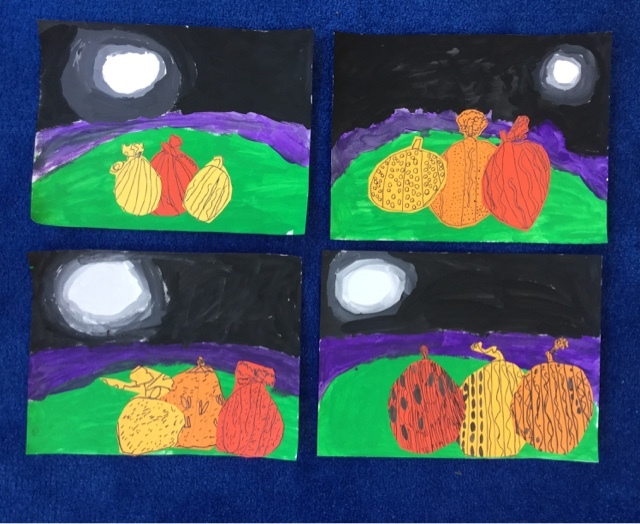 Beautiful seasonal works and lots of great art learning! 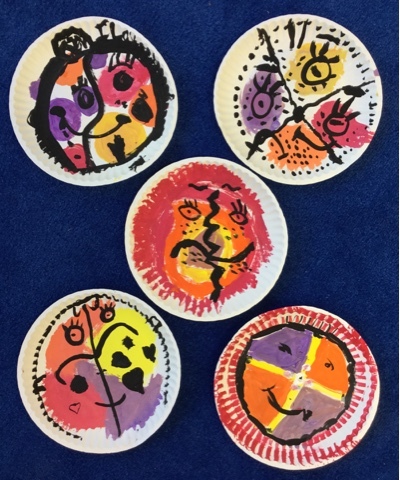 If Picasso were still around today, it would be his 135th birthday- but we can still celebrate his art legacy as one of the world's most famous and accomplished artists. 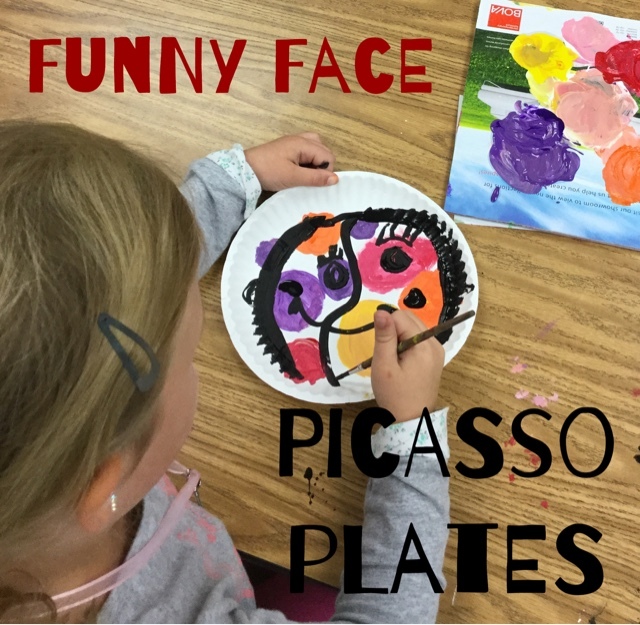 In honor of this special day, my students are getting a crash course in Picasso and creating a Funny Face Picasso Plate, all in one session! 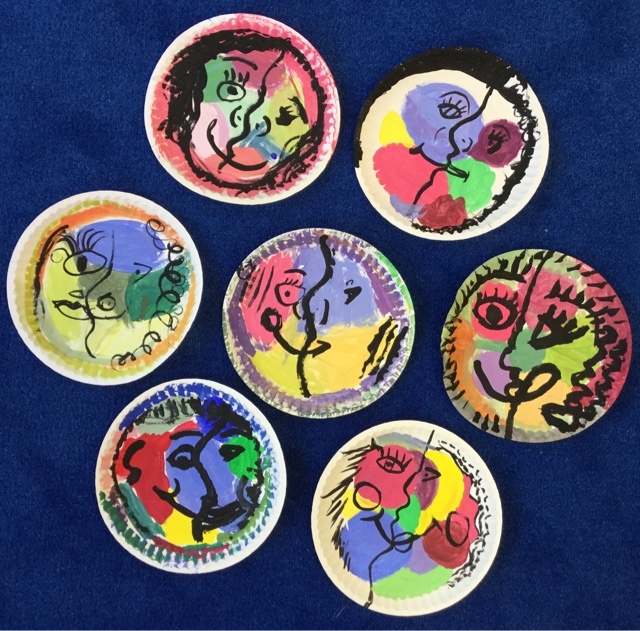 This 45 minute lesson includes a brief history that includes his most famous art periods, a timeline of self-portraits, and a fun painting lesson focusing on expressive color, mixing tints, and a "cubist" face - all on a paper plate, honoring some of my favorite pieces of Picasso's - his painted ceramic plates. 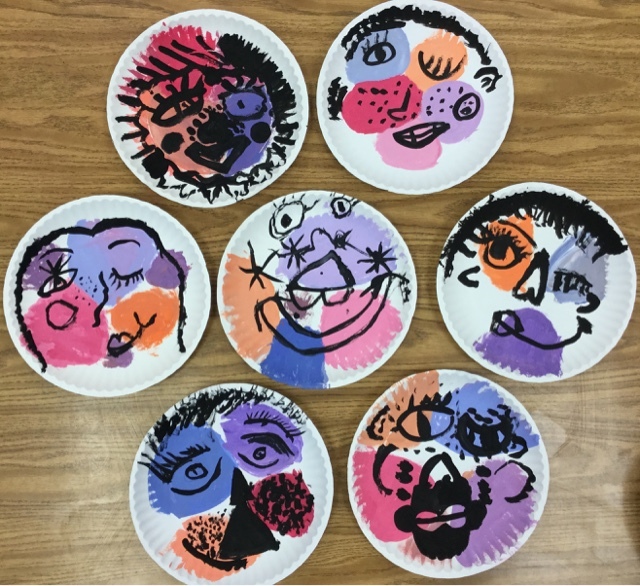 After our "PicassoPoint" presentation, we covered our plates in tint mixtures, sharing thoughts of how the colors represented feelings as in the artist's Blue and Rose periods. 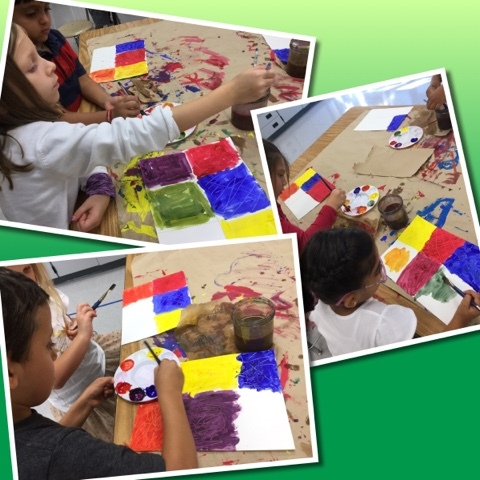 We used magazines for our palettes since multiple classes were doing this activity - easy to tear off and start fresh when needed. 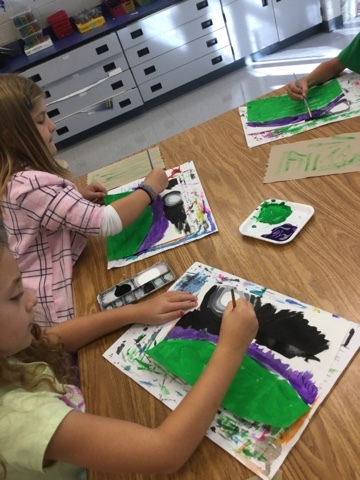 Next, we used smaller brushes dipped in black to create the facial features, remembering that Picasso specialized in mixing up the parts of the face - a cubist technique. 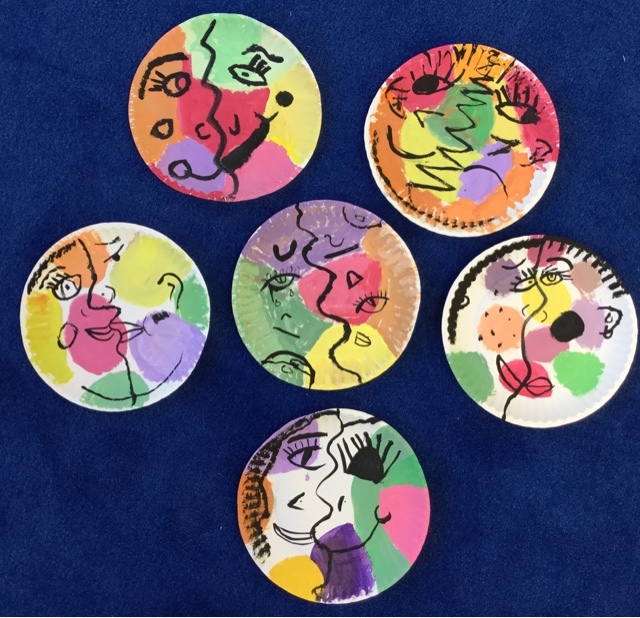 Picasso mastered realistic portraits in his teen years, so in most of his adult life he moved on to painting from his vivid imagination to challenge himself. 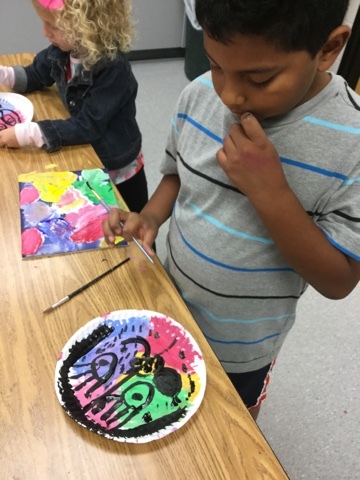 We focused on enjoying ourselves and having fun, just like Picasso might have done on his birthday! 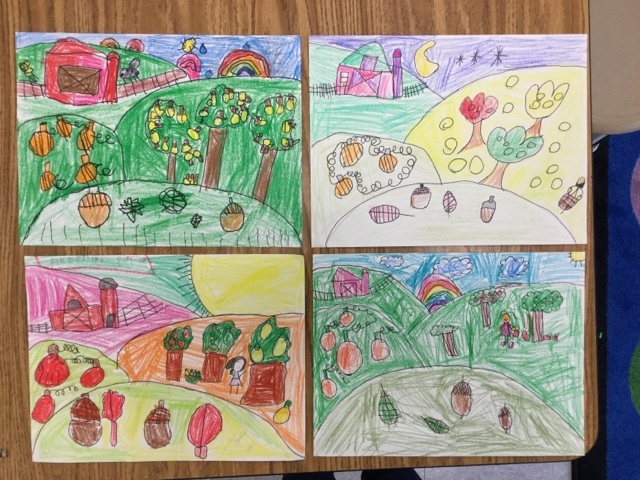 Second graders have completed these charming pumpkin field landscapes while learning about observation drawing and space in a landscape. 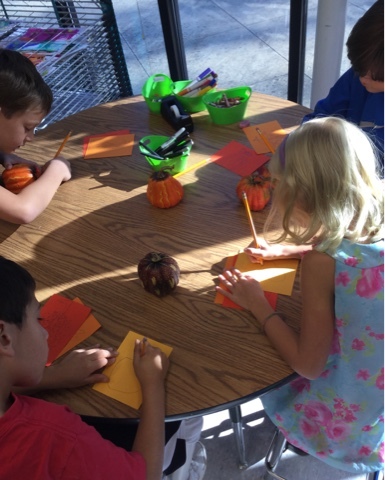 We began by drawing pumpkins on a variety of orange papers, looking closely for details and form. 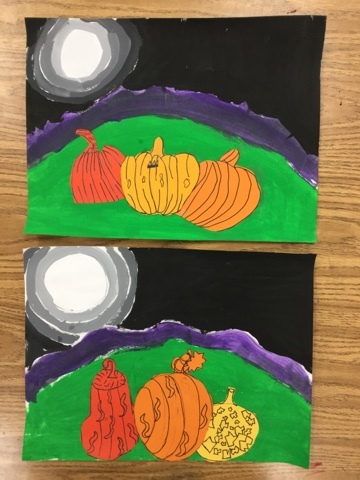 Since the pumpkins would be placed in the foreground of our landscape, we would see lots of details in them, unlike the background forest, which is too far away to see details. 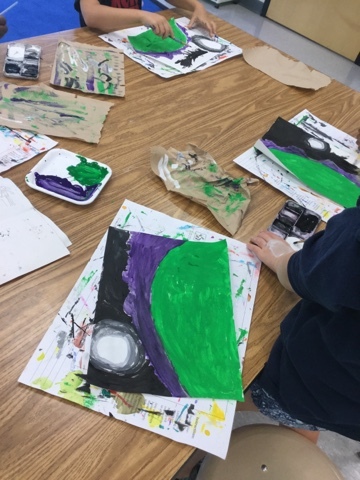 We also painted a glowing moon by mixing shades of gray and creating rings around the white spherical moon. 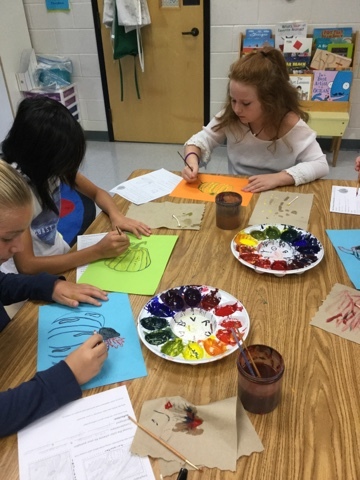 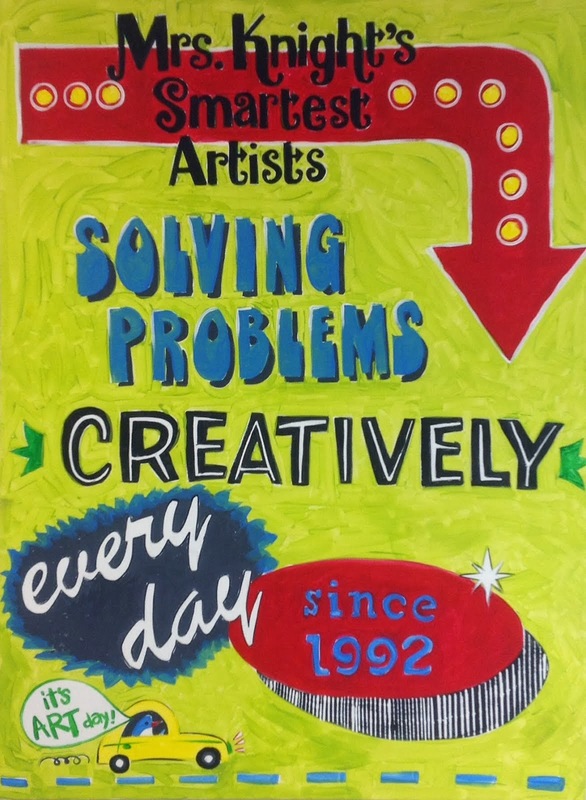 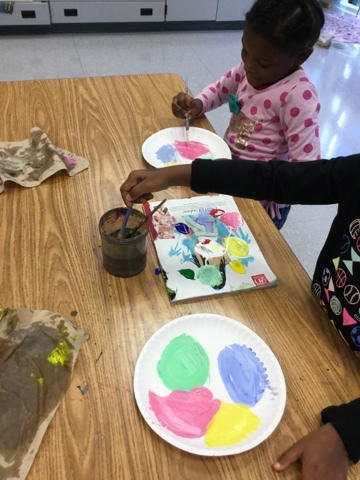 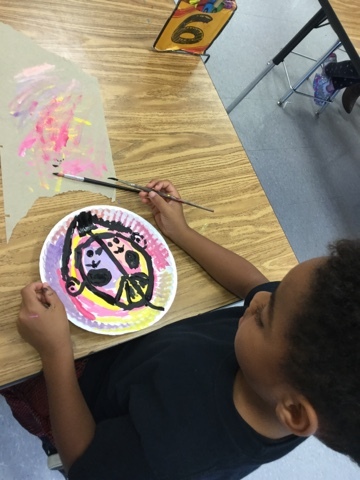 Making connections with our art is an important goal in our classroom, and Language Arts is one of my favorite ways to connect. 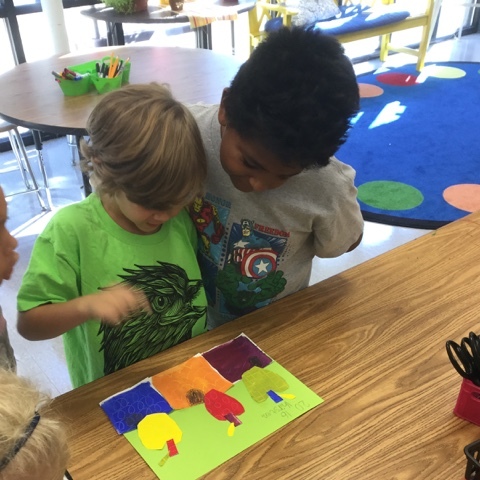 In first grade, we like to find nouns in art, and they are so proud that they know what nouns are when I ask. 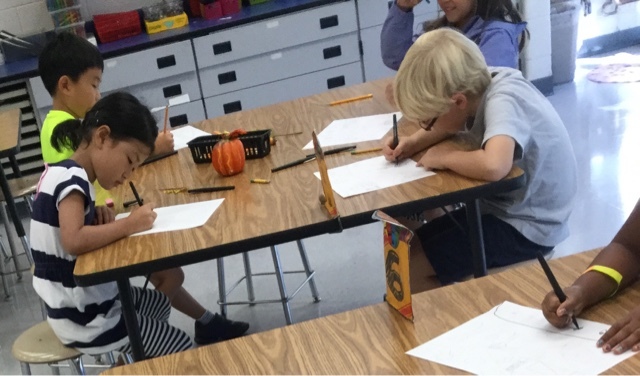 We do a little activity that explains how portraits, landscapes, and still lifes are like the nouns of art - people, places, and things. 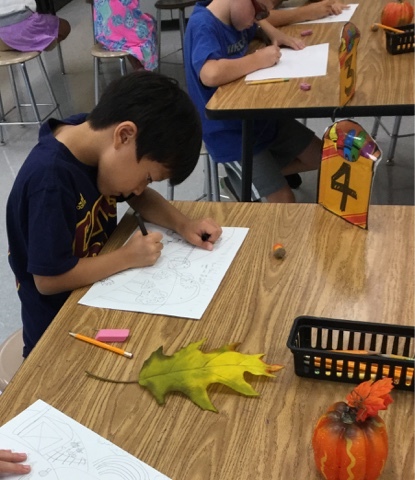 After the warm-up worksheet, we dive into the real works. 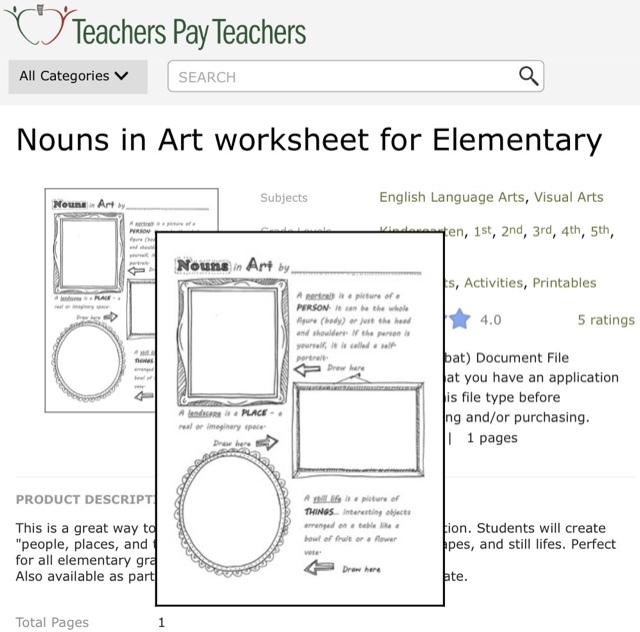 You can find my worksheet right here on TpT. 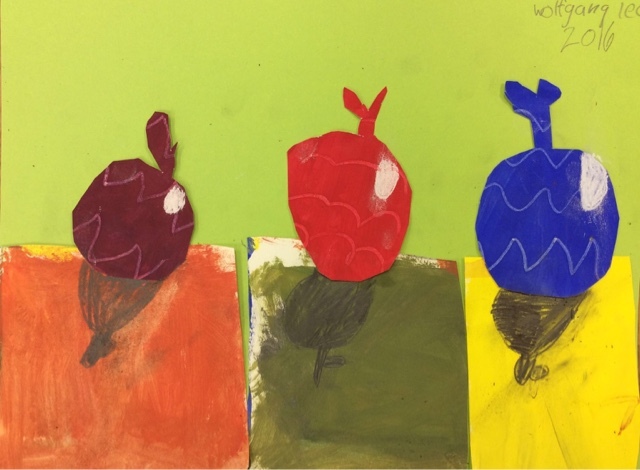 We started with things/still life. 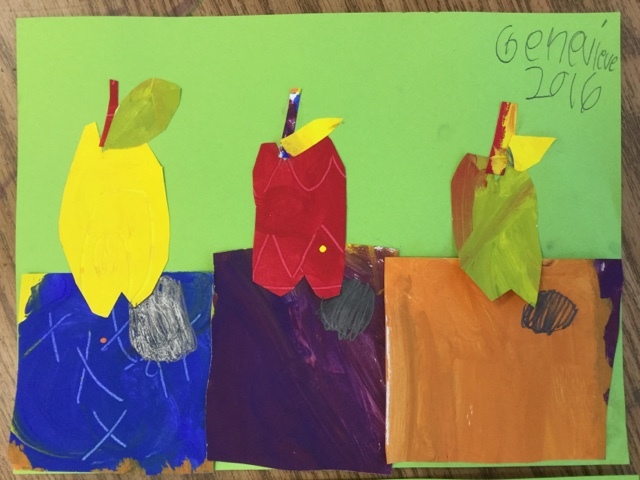 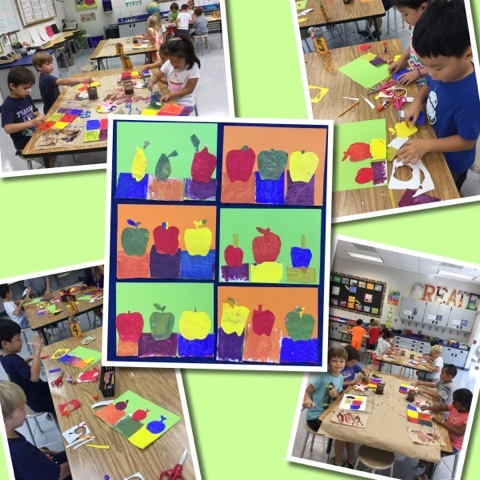 We painted papers with primary colors and then mixed secondary colors, and cut these into shapes for our Apple Still Lifes. 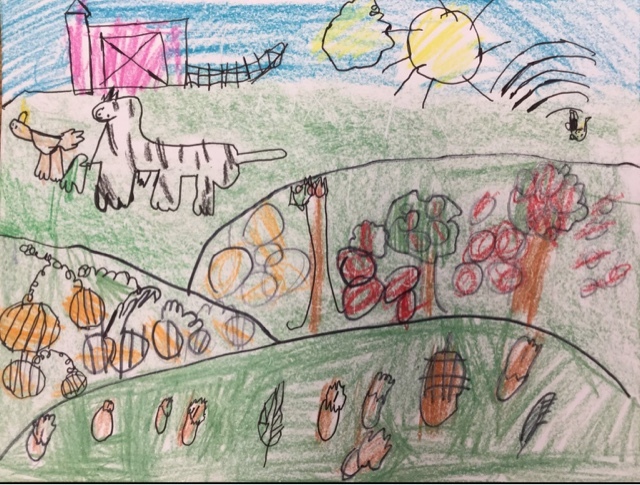 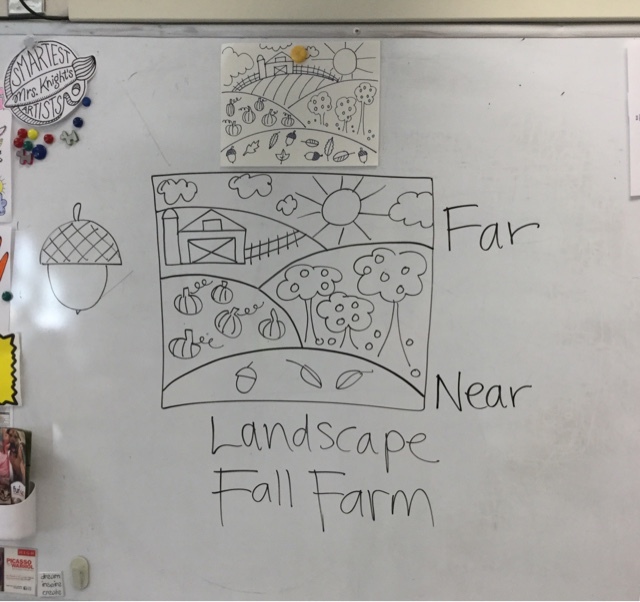 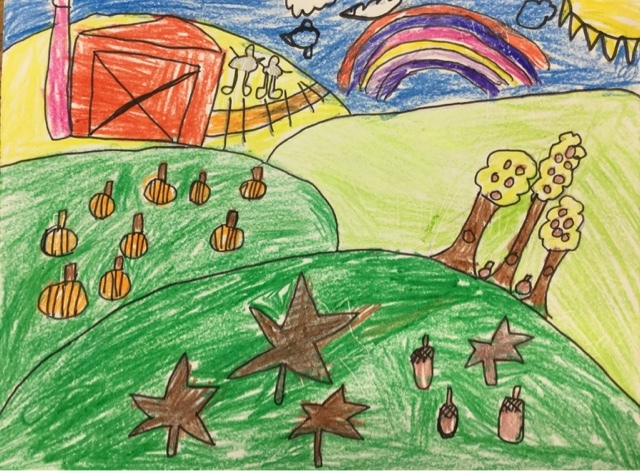 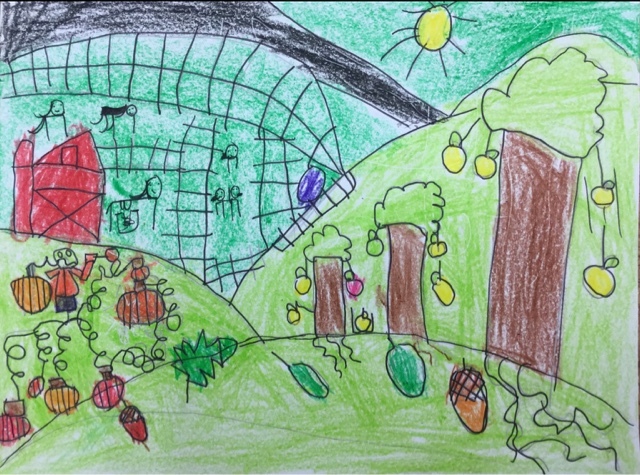 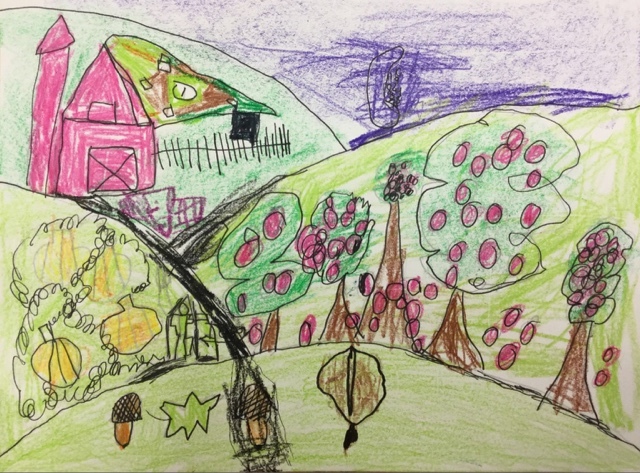 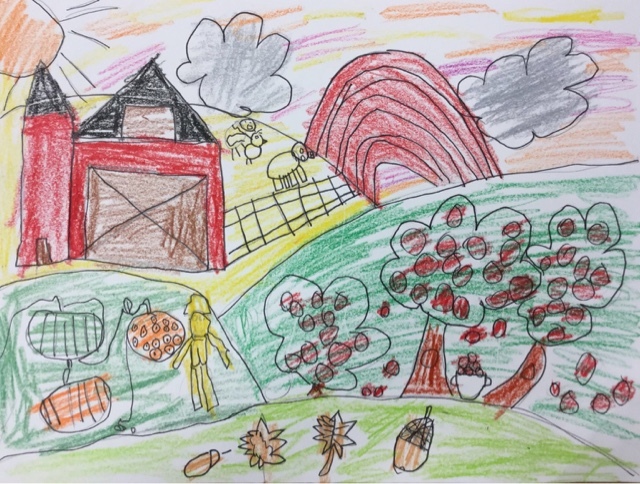 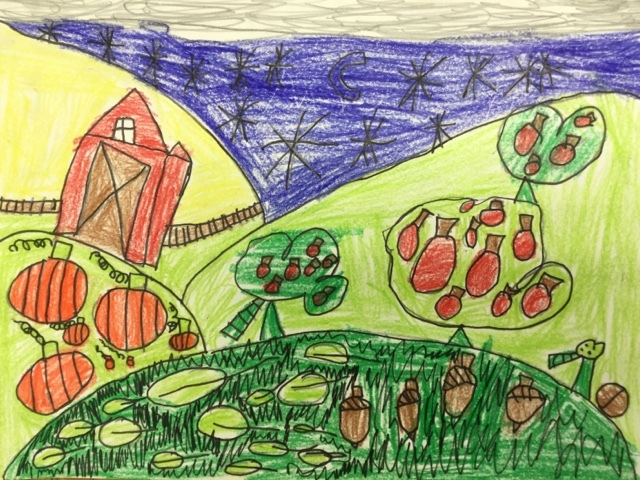 Next up was our fall farm landscape drawing, where we learned about near and far space in a landscape as well as natural forms we see in the fall, like apples, pumpkins, acorns, and beautiful fall leaves. 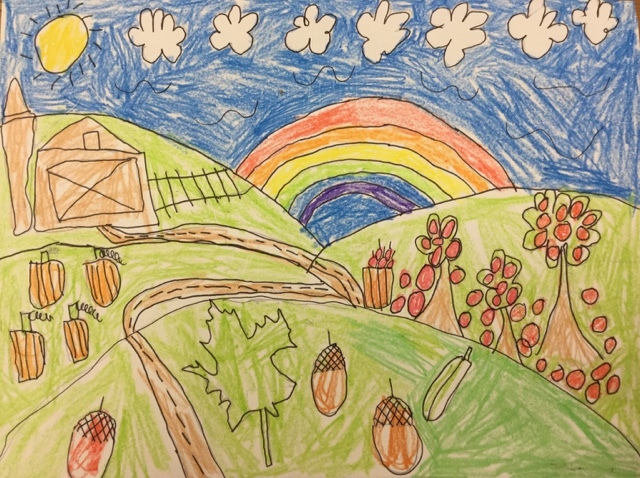 I love challenging the kids to create a sky that is truly unique - we talk about time of day, season, and weather, and the way all of those things affect the color of the sky. 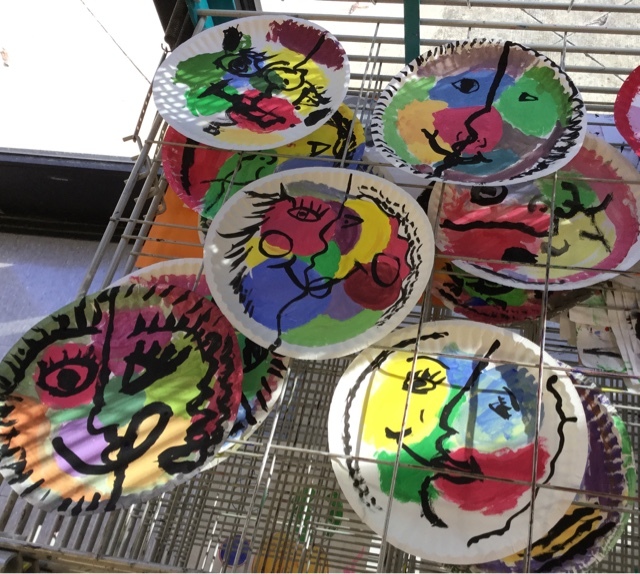 Please stay tuned for the selfies!